Oncolytic viruses can exert their antitumor activity via direct oncolysis or activation of antitumor immunity. Although reovirus is currently under clinical investigation for the treatment of localized or disseminated cancer, any potential immune contribution to its efficacy has not been addressed. This is the first study to investigate the ability of reovirus to activate human dendritic cells (DC), key regulators of both innate and adaptive immune responses. Reovirus induced DC maturation and stimulated the production of the proinflammatory cytokines IFN-α, TNF-α, IL-12p70, and IL-6. Activation of DC by reovirus was not dependent on viral replication, while cytokine production (but not phenotypic maturation) was inhibited by blockade of PKR and NF-κB signaling. Upon coculture with autologous NK cells, reovirus-activated DC up-regulated IFN-γ production and increased NK cytolytic activity. Moreover, short-term coculture of reovirus-activated DC with autologous T cells also enhanced T cell cytokine secretion (IL-2 and IFN-γ) and induced non-Ag restricted tumor cell killing. These data demonstrate for the first time that reovirus directly activates human DC and that reovirus-activated DC stimulate innate killing by not only NK cells, but also T cells, suggesting a novel potential role for T cells in oncolytic virus-induced local tumor cell death. Hence reovirus recognition by DC may trigger innate effector mechanisms to complement the virus’s direct cytotoxicity, potentially enhancing the efficacy of reovirus as a therapeutic agent. Reovirus is a nonenveloped dsRNA virus which is highly prevalent in the human population. It is nonpathogenic in man with the majority of adults showing evidence of prior exposure. Reovirus was initially isolated from human respiratory and gastrointestinal tracts, has a broad cell tropism, and binds to sialic acid and junctional adhesion molecule-1 (1). Reovirus is currently under investigation as a cytotoxic oncolytic virus for the treatment of localized or disseminated cancer. Reovirus targets tumor cells via its selective replication in cells with activated ras signaling (2), with therapeutic benefit shown in a wide range of preclinical models including breast, colon, ovarian, brain, and hematological malignancies (3, 4). Systemic and i.p. delivery, as well as intratumoral injection of virus, have shown promise in these preclinical studies, without evidence of significant toxicity. The mechanisms by which reovirus targets ras-activated cells have not been fully defined. In normal cells, reovirus transcripts bind to protein kinase receptor (PKR),3 causing autophosphorylation and activation. Activated PKR in turn phosphorylates eIF-2α, blocking translation of viral genes. By contrast, in cells with constitutive ras activation, PKR cannot be phosphorylated and reovirus replication ensues (5). Moreover, recent evidence suggests that ras-transformation enhances viral uncoating, infectivity, and virion release (6), and makes cells more sensitive to virus-induced apoptosis (7). Oncolytic viruses have previously been reported to facilitate the priming of specific adaptive antitumor immunity (8, 9, 10). Adaptive immunity following viral treatment comprises both Ab and T cell responses directed against tumor-associated Ags (TAA) as well as viral epitopes. Although the mechanisms by which oncolytic viruses initiate antitumor immunity have not been fully defined, APCs, such as dendritic cells (DC), are likely to be key targets for early viral recognition as they express a range of pattern recognition receptors (PRR), such as TLR, which respond to viral RNA/DNA (11). Significantly, cells infected with viruses have been shown to be more effective at delivering nonviral Ags for cross-priming of APC in vivo (12). The critical, early innate role played by DC in initiating immune responses has recently been described. Different DC subtypes secrete a range of inflammatory cytokines such as type 1 IFNs, TNF-α, and IL-12 in response to PRR/TLR engagement (13). Activated DC then engage in complex cross-talk with other immune effector cells, such as NK cells (14). Whether DC-mediated initiation of early innate responses is relevant to antitumor immune priming following oncolytic viral therapy remains unknown. Certain facets of the structure and fate of reovirus suggest that this virus may be particularly effective at supporting immune priming in the context of tumor cell oncolysis. First, its nonpathogenicity in man indicates that reovirus is effectively recognized and contained by the human immune response it elicits. Secondly, dsRNA is known to activate DC to secrete inflammatory cytokines such as type 1 IFNs which, together with IFN-γ from activated NK cells, can support bystander T cell activation in vivo (15); finally, normal ras signaling in DC should prevent viral protein translation and replication, thus limiting intracellular viral load and potentially facilitating effective uptake and presentation of alternative, nonviral TAA. Interactions between the immune system and reovirus during oncolytic therapy are likely to be complex. In this study, we sought to define the early, innate, human immune consequences of reovirus treatment. Initially, we treated human myeloid DC with reovirus to determine whether reovirus could stimulate DC maturation. Human myeloid DC were used in these studies as they are central to immune priming (16), can be used clinically in immunotherapy (17), and DC of myeloid origin have been identified within the tumor microenvironment (18, 19). Reovirus induced phenotypic DC maturation and the production of inflammatory cytokines. To address whether this DC response to reovirus could impact on downstream pathways of innate anti-tumor immune activation, reovirus-activated DC (reo-DC) were cocultured with autologous NK or T cells. Reo-DC enhanced NK cell IFN-γ production and cytotoxicity against tumor cell targets. Interestingly, cocultured T cells also secreted IFN-γ (and IL-2), and acquired nonspecific killing activity. These data demonstrate that reovirus directly activates human DC, and that infected DC can in turn elicit NK and T cell-mediated innate antitumor activity. These novel findings support the potential of reovirus as an immunogenic as well as cytotoxic therapy for cancer. Daudi cells (B cell lymphoma, Cancer Research U.K., London, U.K.) and EJ (a bladder tumor cell line, ECACC, Wiltshire, U.K.) were grown in RPMI 1640 (Invitrogen Life Technologies), 10% (v/v) FCS (Harlan Sera-Labs), and 1% (v/v) l-glutamine. Cell lines were routinely tested for mycoplasma and found to be free from infection. Human myeloid immature DCs (iDC) were generated from human PBMC by MACS CD14+ selection (Miltenyi Biotec) or monocyte adherence as previously described (20). Monocytes were cultured in RPMI 1640 supplemented with 10% FCS, 1% l-glutamine (complete media), 800 U/ml GM-CSF (Schering-Plough), and 0.05 μg/ml IL-4 (R&D Systems) for 5 days. NK and T cells were isolated using MACS negative depletion kits following standard protocols (>90% and 95% purity, respectively) (Miltenyi Biotec) and CD8+ T cells were isolated using MACS CD8+ microbeads (>80% purity) (Miltenyi Biotec). 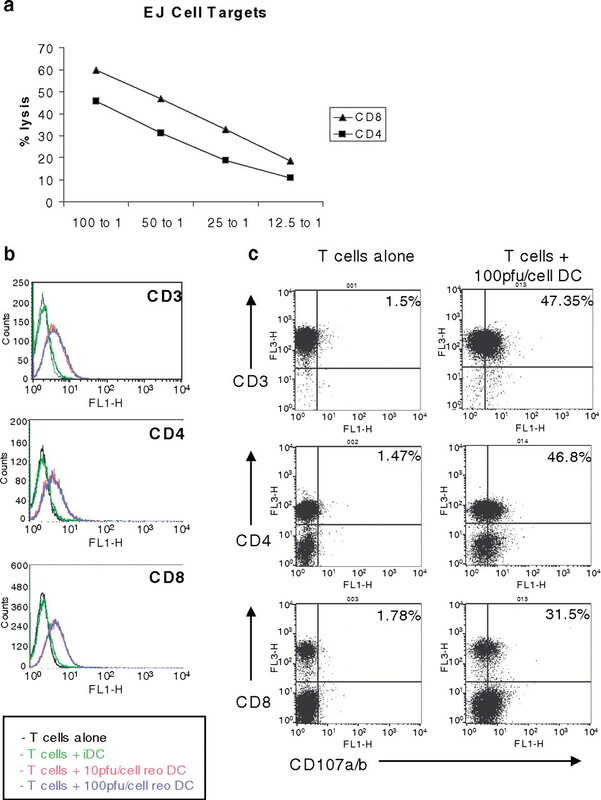 For CD4+ T cells, the CD3+ lymphocytes remaining after positive CD8+ selection were used (>85% purity). Where specified, DC were cultured with 250 ng/ml LPS (Sigma-Aldrich) or 50 μg/ml poly(I:C) (Sigma-Aldrich), either alone or in combination with 100 PFU/cell reovirus. Similarly, where indicated, DC were treated with 1 mM 2-aminopurine (Sigma-Aldrich) or 30 μM caffeic acid phenethyl ester (CAPE) (Alexis) for 1 h before, and during, treatment with 100 PFU/cell reovirus. Neither 2-aminopurine (2-AP) nor CAPE were directly toxic to DC (data not shown). Reovirus type 3 Dearing strain was provided by Oncolytics Biotech. Virus titer was determined by a standard plaque assay using L929 cells (Cancer Research U.K.). Where necessary, reovirus was UV inactivated with 720 millijoules irradiation, using a UV stratalinker 2400 (Stratagene). DC were incubated with CD80-PE, CD86-PE, and CD83-PE (BD Pharmingen). Cells were acquired using a FACSCalibur (BD Biosciences). Protein from control and reovirus-treated DC (wild type and UV inactivated) were electrophoresed (30 μg protein/lane) and transferred onto nitrocellulose following standard protocols. TAP1 expression was detected using a rabbit-polyclonal Ab (Stressgen). β-actin was detected using a rabbit polyclonal anti-β-actin Ab (Abcam). Allogeneic T cell proliferation was measured using [3H]-thymidine incorporation, as previously described (21). In brief, whole PBMCs cells were cocultured with allogeneic iDC or reo-DC at a 20:1 ratio for 5 days before addition of [3H]-thymidine (0.5μCi/per well) for 18 h. Cells were harvested onto filter mats using a TOMTEC harvester 96 MachIIIM and [3H]-thymidine incorporation was determined using a Wallac Jet 1459 Microbeta scintillation counter and Microbeta Windows software (Wallac). IL-2, IL-6, IL-12p70, TNF-α, and IFN-γ were detected using matched paired Abs (BD Pharmingen); IFN-α was detected using luminex technology (Biosource) according to the manufacturer’s instructions. DC were harvested on day 5 and either left untreated or treated with 10 or 100 PFU/cell reovirus for 6 h. DC were then harvested and resuspended at a 1:2 ratio with either NK or T cells (DC:NK/T) and cultured for a further 16 h. To determine whether NK and T cells were activated by soluble factors released by DC or via cell:cell interactions, coculture experiments were set up as above, or in the presence of a 0.4 μm transwell (Corning) to separate T/NK cells from DC. DC, NK, and T cell cytotoxicity was measured using a standard 4 h 51Cr release assay as previously described (20). In brief, tumor cell targets (EJ and Daudi) were labeled with 100 μCi 51Cr for 1 h, and washed three times in RPMI 1640 containing 10% FCS and 1% glutamine. Labeled cells were then cocultured with DC:NK cells, DC:T cells, or DC alone at different E:T ratios. After 4 h cells were pelleted and 50 μl of supernatant was transferred to scintillation plates (Packard Biosciences) and left to dry overnight. Levels of 51Cr were determined using a Wallac Jet 1459 Microbeta scintillation counter and Microbeta Windows software (Wallac). To examine the granzyme/perforin dependence of NK and T cell cytotoxicity, cocultures were set up in the presence or absence of 2 mM EGTA (Sigma-Aldrich) (22). Percent lysis was calculated using the following formula: % lysis = 100 × (sample cpm – spontaneous cpm)/(maximum cpm − spontaneous cpm). The CD107a/b cytotoxicity assay allows detection of cytotoxic cells by examining degranulation in response to tumor cell targets (23). In brief, T cells were cocultured at a 1:1 ratio with EJ tumor cell targets in the presence of 10 μl FITC-conjugated CD107a/b Abs (BD Pharmingen). After 1 h Brefeldin A (Sigma-Aldrich) was added at 10 μg/ml and cells were incubated for a further 4 h. T cells were costained with CD3, CD4, or CD8 before cell acquisition, and surface expression of CD107a/b on T cells indicates the release of cytotoxic granules. To address a potential role for reovirus as an immune adjuvant as well as a cytotoxic agent, we first assessed the effect of reovirus on DC from healthy individuals, as key sensors of viral infection. Previous reports have shown that synthetic and virus-derived dsRNA can activate DC (24); however, the effect of wild-type reovirus on DC has not been previously investigated. Preliminary experiments showed that reovirus was not toxic to DC at multiplicity of infection <100, and plaque assays confirmed that reovirus did not replicate in DC (data not shown). The addition of reovirus induced phenotypic activation of iDC, with up-regulation of CD80, CD86 and CD83 (Fig. 1⇓a). This activation was accompanied by up-regulation of TAP-1, a further marker of DC maturation (25) (Fig. 1⇓b), and an enhanced ability to stimulate the proliferation of allogeneic T cells (Fig. 1⇓c), confirming the functionally mature state of DC following reovirus treatment. These results were replicated in limited experiments performed using blood from patients with advanced, metastatic colorectal cancer, which showed that DC from cancer patients were similarly activated in response to reovirus (data not shown). Reovirus activates human DC. a, DC were either left untreated or treated with 1, 10, or 100 PFU/cell reovirus for 48 h. Surface expression of CD80, CD86, and CD83 was analyzed by FACS. Data shown are representative of four independent experiments. b, iDC or DC treated with 10 PFU/cell reovirus for 24 h were harvested and whole cells lysates were prepared. Proteins were separated by SDS gel electrophoresis and expression of TAP-1 or β-actin determined by Western blot. Data shown are representative of four independent DC donors. c, iDC and Reo-DC (10 PFU/cell and 100 PFU/cell) were cocultured at a 20:1 ratio with allogeneic PBMCs for 5 days and [3H]-thymidine incorporation was determined. Error bars show mean ± SEM (n = 6). A key determinant of immune priming following DC maturation is the profile of cytokines secreted by activated DC. We found that reo-DC secreted the inflammatory cytokines TNF-α, IL-6, IL-12p70, and IFN-α (Fig. 2⇓a). IL-10, a feature of tolerogenic DC, was not detected (data not shown). Because different PRR ligands can synergize when activating DC (26), we also investigated the effect of reovirus on DC when used in combination with LPS (a TLR4 ligand) or poly(I:C) (a TLR3 ligand). 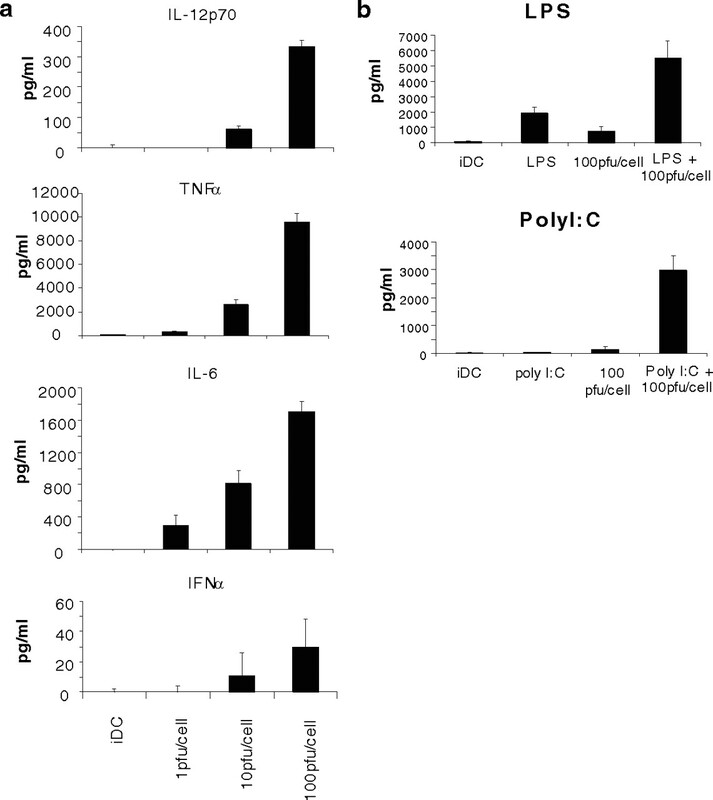 Addition of either LPS or poly(I:C) significantly increased DC secretion of IL-12 in response to reovirus (p < 0.05 for combination vs reovirus alone; Fig. 2⇓b). IL-12 is shown as a representative cytokine; the same pattern was seen for TNF-α and IL-6 (data not shown). These data show that reovirus activates DC both phenotypically and functionally, and that this effect is enhanced in the presence of additional DC maturation stimuli. Hence, reovirus, in contrast to some other viruses which specifically target and suppress DC development and function (27, 28, 29), effectively activates DC for potential downstream initiation of innate and adaptive immune effector functions. Reovirus stimulates DC to secrete inflammatory cytokines. a, Cell supernatants from either iDC or DC treated with 1, 10, or 100 PFU/cell reovirus for 48 h were harvested and the presence of IL-12p70, IFN-α, TNF-α, and IL-6 (n = 3–10) was determined by ELISA. Error bars show mean of all repeats ± SEM. b,DC were either left untreated, treated with LPS, poly(I:C), or 100 PFU/cell reovirus alone, or treated with LPS or poly(I:C) in combination with 100 PFU/cell reovirus for 48 h (n = 2–4). Cell supernatants were harvested and the production of IL-12p70 was determined by ELISA. Error bars show mean ± SEM. No evidence of reovirus replication in DC was detected by plaque assay or Western blot analysis (as expected for cells of normal ras status, data not shown). To further address whether reovirus replication is required for DC activation, iDC were treated with live or UV-inactivated reovirus before analysis. Fig. 3⇓a shows that UV-treated, replication incompetent reovirus matured DC to a similar level as live virus, confirming that reovirus replication was not required for DC activation. Reovirus activates DC via PKR and NF-κB and is independent of viral replication. a, DC were either left untreated or treated with 1, 10, or 100 PFU/cell wt or UV inactivated reovirus for 24 h. i, DC were harvested and the expression of CD86 was determined by FACS. Data show median fluorescence values of all repeats ± SEM (n = 3). ii, Cell supernatants were harvested and levels of TNF-α examined by ELISA. Error bars show mean ± SEM (n = 3). b, Levels of TNF-α produced by iDC or DC treated with 100 PFU/cell reovirus ± 1 mM 2-aminopurine were determined by ELISA. Error bars show mean ± SEM (n = 4). c, Levels of TNF-α produced by iDC or DC treated with 100 PFU/cell reovirus ± 30 μM CAPE were determined by ELISA. Error bars show mean ± SEM (n = 7). Because previous data support a critical role for cytoplasmic PKR in mouse DC recognition of reovirus dsRNA (24), the role of PKR in human iDC activation was investigated using 2-AP, a known inhibitor of PKR (24). Blockade of PKR had no effect on DC phenotypic activation (data not shown); however, 2-AP significantly abrogated DC cytokine (TNF-α) secretion (Fig. 3⇑b). Further downstream signaling pathways reported to be activated by reovirus include the MAPK cascades and NF-κB (30, 31). Moreover, NF-κB has been implicated in downstream signaling from PKR (32), and for the transcription of proinflammatory cytokines in response to dsRNA (33). We therefore also tested the dependence of DC maturation upon NF-κB using its small molecule inhibitor CAPE (34). As shown in Fig. 3⇑c, secretion of TNF-α was also significantly abrogated by CAPE, while up-regulation of DC surface markers was not affected (data not shown). Hence, cytokine production by DC in response to reovirus is dependent on PKR and NF-κB signaling, but not on viral replication. The importance of DC:NK cell interactions for regulating both innate and adaptive immunity has been increasingly recognized. We therefore tested the effect of reo-DC on NK cell function. DC were either left untreated or activated with reovirus before coculture with autologous NK cells, and cell supernatants were first harvested and analyzed for IFN-γ, as an indicator of NK cell activation. Fig. 4⇓a shows that NK cells secreted IFN-γ when cocultured with reo-DC, but not iDC (neither iDC nor reo-DC cultured alone secreted IFN-γ, data not shown). Reo-DC were also effective at stimulating NK cell cytotoxicity against tumor cells, inducing higher levels of killing than exposure of NK cells to IL-2; iDC had no effect on NK killing (Fig. 4⇓b), and neither iDC nor reo-DC alone were cytotoxic (data not shown). Significantly, reovirus was unable to activate NK cells on direct application in the absence of DC (data not shown). Reo-DC activate NK cells. a, Reo-DC were cocultured with autologous NK cells overnight and the production of IFN-γ determined by ELISA. Error bars show mean ± SD (n = 3). Data are representative of two independent experiments. b, NK cells were left untreated, stimulated with IL-2, or cocultured with iDC or Reo-DC (10 or 100 PFU/cell) for 16 h. NK cytotoxicity against Daudi and EJ cell targets was analyzed by 51Cr release assay. Data shown are representative of at least three independent experiments. c, iDC or Reo-DC (10 and 100 PFU/cell) were cocultured with NK cells for 16 h with or without a transwell membrane. NK cytotoxicity against Daudi and EJ cell targets (at a 10:1 ratio) was analyzed by 51Cr release. Error bars show mean ± SD (n = 3). Data shown are representative of two independent experiments. d, NK cells were cocultured with 10 PFU/cell Reo-DC for 16 h and NK cytotoxicity was determined by 51Cr release assay in the presence or absence of EGTA. Data shown a representative of three independent experiments. DC have previously been reported to activate NK cells through the release of proinflammatory cytokines such as IFN-α, TNF-α, IL-15, and IL-12 (35, 36). To determine the dependence of reo-DC activation of NK cells on cell:cell contact, NK cell cytotoxicity was examined after direct DC:NK coculture or when DC were separated from NK cells using a transwell. We found that NK cell cytotoxicity was enhanced irrespective of these culture conditions, demonstrating that reo-DC activated NK cells through the release of soluble factors (Fig. 4⇑c). Because DC secrete IFN-α, TNF-α, and IL-12 in response to reovirus, (Fig. 2⇑a), this finding is consistent with currently recognized mechanisms of DC-induced NK activation. NK cells exert their cytotoxic effects by a range of different mechanisms, including exocytosis of perforin/granzyme and via interactions between the TNF superfamily death receptors and their cognate ligands such as Fas/FasL and TNF/TNFR (37). These pathways can be differentiated in vitro by analyzing the requirement of Ca2+ for cytotoxicity, since only granule-mediated cell death is dependent on Ca2+ (37). To address the mechanism by which reo-DC activated NK cells kill, cytotoxicity assays were performed in the presence or absence of EGTA, which binds Ca2+ making it unavailable for granule exocytosis. Fig. 4⇑d demonstrates that NK cell killing was completely abrogated by EGTA, showing that reo-DC enhanced NK cell cytolysis via exocytosis of perforin/granzyme. In addition, NK killing was dependent on cell:cell contact with targets (data not shown), also consistent with a perforin/granzyme mechanism. This activation of NK cells by reo-DC gives further insight into the potential mechanisms by which reovirus may exert antitumor effects in vivo. Conventionally, the primary function of DC:T cell interactions is to support priming of Ag-specific CTL. In addition to this Ag-specific cytotoxicity, it has been increasingly recognized that T cells also play a role in innate immunity, and can be activated by cytokines to kill in a non-Ag restricted manner via TRAIL (38) or perforin/granzyme (39). We therefore also investigated the effect of reo-DC on innate T cell effector functions. As for NK cells, reovirus did not activate T cells when applied directly (data not shown). Fig. 5⇓a shows that T cells briefly cocultured with either iDC or reo-DC secreted IL-2, although reo-DC induced higher levels; IFN-γ production was restricted to reo-DC-activated T cells (iDC or reo-DC cultured alone secreted neither IL-2 nor IFN-γ, data not shown). Next, the ability of activated T cells to kill HLA class I positive (EJ) or negative (Daudi) tumor cell targets was examined (Fig. 5⇓b). Neither T cells alone, nor T cells cocultured with iDC displayed significant levels of cytotoxicity; in contrast, T cells cocultured with reo-DC killed up to 30% of EJ and 50% of Daudi cell targets. Therefore, reo-DC activated autologous T cells to kill tumor cell targets regardless of their MHC class I status. Reo-DC activated T cells. a, Cell supernatants from T cells alone, or T cells cocultured with iDC or Reo-DC (10 or 100 PFU/cell reovirus) for 16 h were harvested and the production of IL-2 and IFN-γ determined by ELISA. Error bars show mean ± SD (n = 3). b, T cells were left untreated or cocultured with iDC or Reo-DC (10 or 100 PFU/cell) for 16 h. T cell cytotoxicity against Daudi and EJ cell targets was analyzed by 51Cr release assay. Data shown are representative of at least three independent experiments. c, iDC or Reo-DC (10 and 100 PFU/cell) were cocultured with T cells for 16 h with or without a transwell membrane. NK cytotoxicity against Daudi and EJ cell targets was analyzed by 51Cr release assay (at a 100:1 ratio). Error bars show mean ± SD. Data are representative of two independent experiments. d, T cells were cocultured with 10 PFU/cell Reo-DC for 16 h and T cell cytotoxicity determined by 51Cr release assay in the presence or absence of 2 mM EGTA. Data shown are representative of three independent experiments. As for reo-DC-activated NK killing, we addressed the mechanism of T cell activation by reo-DC by performing cytotoxicity assays with and without transwells. Fig. 5⇑c shows that, in contrast to NK cells, reo-DC activated T cells via cell:cell interactions, because T cell cytotoxicity was consistently and significantly reduced (p < 0.05) when reo-DC and T cells were separated in a transwell system. Moreover, the killing by reo-DC-activated T cells was, as for reo-DC activated NK cells, mediated by perforin/granzyme, because it was abolished in the presence of EGTA (Fig. 5⇑d). Again, this was corroborated by the dependence of this innate killing on cell contact between effector T cells and their targets (data not shown). One possible explanation for the increased innate cytotoxicity of T cells on coculture with reo-DC is a decrease in regulatory T cells (Treg) within the DC:T cell cocultures. However, experiments conducted in healthy donors showed that the percentage of CD4+, CD25+ FOXP3+ T reg cells in fact increased on coculture with either iDC or reoDC, demonstrating that Treg depletion is not responsible for the enhanced cytotoxicity of T cells cocultured with reo-DC (data not shown). More detailed analysis of the effects of reovirus on Treg function is currently ongoing in our laboratory. Small subpopulations of T cells have been previously identified which display innate, NK-like cytotoxic functions including NKT cells, γδ T cells, and some CD4+ regulatory T cells. To further define which T cells activated by reo-DC were responsible for the cytotoxic effects observed, we separated CD4+ and CD8+ T cells before coculture with reo-DC and then analyzed their cytotoxic potential. Fig. 6⇓a shows that both CD4+ and CD8+ T cells acquired significant cytotoxicity in response to reo-DC. To confirm that this cytotoxicity was a general phenomenon affecting all T cells rather than a small subpopulation, a CD107 cytotoxicity assay was used. This assay identifies only those cells that are actively secreting cytotoxic granules by surface staining for CD107 a/b (23). All CD3+, CD4+, and CD8+ T cells up-regulated surface CD107a/b expression after activation with reo-DC following coculture with tumor cell targets (Fig. 6⇓b); quantitatively, dot plots showed that 47.35% of CD3+, 46.8% of CD4+, and 31.5% of CD8+ T cells expressed CD107a/b (Fig. 6⇓c). These results show that reo-DC stimulated degranulation is a feature of a significant proportion of T cells, and is not restricted to a small subpopulation; hence, generalized induction of innate T cell cytotoxicity following coculture with reovirus-activated DC provides a further potential mechanism for reovirus anti-tumor activity within the tumor microenvironment. Reo-DC induce innate cytotoxicity in all T cells, not a restricted subpopulation. a, CD4+ or CD8+ T cells were cocultured with Reo-DC (10 PFU/cell) for 16 h and T cell cytotoxicity against EJ cell targets was determined by 51Cr release assay. Data shown are representative of three independent experiments. b, T cells were either left untreated or cocultured with iDC or Reo-DC (10 and 100 PFU/cell) for 16 h. T cells were cocultured with EJ cell targets and expression of CD107a/b on CD3, CD4, and CD8 cells was determined by FACS. Histograms demonstrating CD107a/b expression are shown. Data are representative of three independent experiments. c, T cells were cocultured as described for Fig. 6⇓b. Dot plots demonstrating the percentage of CD3+/CD107a/b+, CD4+/CD107a/b+, and CD8+/CD107a/b+ cells are shown. Oncolytic viruses have been investigated as anticancer agents since the 1950s with some evidence of clinical efficacy. Anticancer activity may be mediated by both direct virus cytotoxicity and the generation of an antitumor immune response (3, 4, 8, 9, 10). The exact role of different immune effector cells in oncolytic virus-mediated tumor regression has not been clearly defined. DC are likely to play a coordinating role in this immune response as key APC which recognize viral and bacterial infections and regulate both innate and adaptive immunity. This study investigated the ability of reovirus, an anticancer agent currently in phase I/II clinical trials, to activate DC and potential downstream effector cells of the innate immune response. We have shown that reovirus up-regulated the expression of Ag processing (TAP1) and costimulatory (CD80, CD86 and CD83) molecules on DC (Fig. 1⇑), and induced the secretion of IFN-α, IL-6, IL-12p70, and TNF-α. (Fig. 2⇑). Reovirus-induced DC activation was not dependent on viral replication and cytokine production (but not phenotypic maturation) involved signaling via PKR and NF-κB (Fig. 3⇑). Reovirus-activated DC enhanced innate NK and T cell cytotoxicity by the release of soluble factors and cell:cell contact respectively, inducing tumor cell killing via exocytosis of cytoytic granules. Innate T cell cytotoxicity was mediated by a significant proportion of the CD3+ population (both CD4+ and CD8+), rather than any restricted, small lytic subpopulation of cells. This demonstrates for the first time that reovirus activates DC and that these virus-activated DC can promote non-Ag restricted killing by T cells, as well as NK cells. These data suggest that the antitumor activity of reovirus may occur via both direct tumor cell oncolysis and localized activation of innate antitumor immune effector cells. Limited phenotypic and functional maturation of DC was observed with low doses of reovirus, and DC activation was maximal at 100 PFU/cell. Although this represents a high viral titer, one of the potential advantages of replication competent viral therapy is that localized viral replication and oncolysis should lead to high levels of free virus within the tumor microenvironment. Moreover, a recent phase I clinical trial investigating the toxicity of systemic i.v. reovirus therapy showed that reovirus could safely be administered at high doses (3 × 1010 TCID50 for 5 consecutive days repeated 4-weekly) with acceptable toxicity (L. Vidal et al., submitted for publication). Because DC respond to bacterial and viral infections through PRR which detect foreign motifs such as CpG and ss/dsRNA, it was possible that DC activation occurred via recognition of the reovirus dsRNA genome via receptors such as TLR-3 or PKR. Our data showing a role for PKR (Fig. 3⇑b) are consistent with a previous report of the murine bone marrow-derived DC response to dsRNA (24). Moreover, our finding that inflammatory cytokine production by DC in response to reovirus is significantly blocked by CAPE (Fig. 3⇑c), also tallies with a previous study showing the further dependence of PKR signaling on NF-κB activation (33). In contrast, DC phenotypic activation was not dependent on PKR or NF-κB (data not shown), suggesting DC also recognize reovirus via a separate, PKR-independent mechanism. Experiments conducted in the presence of a TLR-3 blocking Ab failed to confirm a role for TLR-3 in reovirus recognition, although successful access of the Ab to intracellular TLR-3 cannot be assumed, as previously demonstrated in a study addressing IFN-β production by DC in response to poly(I:C) (40). Our data are consistent with a model in which recognition by, and activation of, innate immune effector cells within the tumor microenvironment in response to reovirus may play a potential role in its antitumor therapy. Other oncolytic viruses, such as Newcastle Disease Virus and measles virus, have been shown to stimulate innate antitumor activity by up-regulation of TRAIL on human monocytes and neutrophil infiltration of tumors, respectively (41, 42). Although the current study is restricted to the human systems which are of greatest relevance to reovirus as a clinical reagent, this hypothesis is also supported by parallel murine studies, which have shown that a reovirus-resistant tumor cell line can nevertheless by effectively treated in vivo following intratumoral injection, via a CD8 and NK-dependent mechanism (manuscript in preparation). Although various subtypes of DC have been increasingly recognized as key detectors of viral infection, this is the first study addressing the potential innate therapeutic significance of virus recognition by DC during oncolytic virus therapy. Reciprocal activation between NK cells and mature DC has previously been reported (14); for example, poly(I:C) activated DC enhance NK effector functions (36). In this study, we have similarly demonstrated that NK cell cytokine production and cytolytic potential was enhanced by reo-DC (Fig. 4⇑). Mechanistically, DC-induced NK cell activation can occur via the release of soluble factors such as IFN-α, TNF-α, and IL-12 (35, 36), all of which were secreted by the reo-DC (Fig. 2⇑a) which activated NK cells via a contact-independent mechanism (Fig. 4⇑c). However, the relative role of these or other cytokines in NK activation by reo-DC awaits more detailed characterization. A role for NK cells in tumor regression has been well documented in mouse models, either by direct tumor recognition or via DC activation (43). Because NK cells are often recruited to sites of inflammation including the tumor microenvironment (14), and clinically tumor infiltrating NK cells have been associated with improved prognosis in a range of different tumor cell types (44, 45), treatments which can activate intratumoral NK cells may show additional, immune-mediated activity. Fewer reports have described the innate killing mechanisms of T cells, although Newcastle Disease Virus and type I IFNs can increase TRAIL expression on PBMCs and isolated human T cells (38, 46). More recently, non-Ag restricted killing by T cells via perforin/granzyme has also been described after short term (3–7 days) culture of T cells with IL-15 or IL-2 (39, 47). These cells are distinct from the well-documented cytokine-induced killer cells, which are generated after long term in vitro expansion (14 day) using IFN-γ, anti-CD3, and IL-2 (48). Our studies demonstrate that reo-DC enhance innate T cell cytotoxicity via contact-dependent interactions after short-term coculture (Fig. 5⇑c), and that this T cell cytotoxicity was dependent on perforin/granzyme (Fig. 5⇑d). The CTLs, generated following overnight culture with reo-DC, killed both class I positive (EJs) and negative (Daudi) tumor cell targets, confirming that killing was independent of MHC status. To our knowledge, this ability of activated DC to induce innate T cell killing has not previously been described. Although the physiological significance of this finding remains unclear, there are a number of potential roles to be envisaged for DC-activated, non-Ag restricted T cell killing in the context of local virus infection. For example, innate killing will release an array of proteins for DC Ag processing/presentation, potentially leading to priming of specific Ag-restricted CTL. In addition, enhanced T cell killing may help control viral infection by early removal of infected host cells, a hypothesis further supported by preliminary studies conducted in our laboratory, showing that reo-DC-activated T cells kill virally infected targets more efficiently than noninfected targets. Whether innate T (or NK) killing of virus-infected tumor cells potentially limits the spread and hence efficacy of therapeutic oncolysis, rather than providing useful bystander killing, requires further study, although recent murine data suggest that T cells overall enhance, rather than restrict, oncolytic viral therapy ((10) and our own unpublished data). With regard to adaptive immunity, reports have shown that infection of tumor cells with oncolytic viruses can facilitate the priming of specific antitumor immunity by enhancing cross presentation of TAA by APC (8, 9, 12); our own early data suggest that reovirus infection can similarly support priming of TAA-specific CTL responses (unpublished observations). There are data to suggest that i.v. reovirus is more effective in vivo if given together with immunosuppression to blunt the anti-viral Ab response (49). Alternatively, however, and consistent with our own data, a role for immune effector cells in reovirus therapy has been previously implicated (50). Potentially, the site of reovirus administration and replication in such studies will be critical in determining whether the immune response limits or supports the antitumor effects of oncolytic viruses. Although systemic delivery triggers a robust Ab response, virus specifically at the tumor site may reverse the immunosuppressive milieu there. Consistent with this hypothesis, we have found that infection of melanoma cells with reovirus directly triggers secretion of a range of proinflammatory cytokines/chemokines (F. Errington et al., submitted for publication). The current data demonstrate that reovirus, an oncolytic dsRNA virus, activates DC to support innate NK and T cell cytotoxicity. This immune activation may contribute to the therapeutic effects of the virus, although in vivo correlates and the potential for subsequent adaptive antitumor immune priming remain to be fully addressed. By characterizing the effects of reovirus on human DC, together with the consequent downstream activation of NK and T cells, this study highlights the potential of reovirus to harness the innate immune system for anti-tumor therapy. We thank Oncolytics Biotech, Calgary, Canada for providing Reovirus (REOLYSIN), and Sandra Diebold for helpful discussions. ↵1 This work was supported by Cancer Research U.K. and Oncolytics Biotech. ↵3 Abbreviations used in this paper: PKR, protein kinase receptor; TAA, tumor-associated Ag; PRR, pattern recognition receptor; DC, dendritic cell; reo-DC, reovirus-activated DC; iDC, immature DC; 2-AP, 2-aminopurine; Treg, regulatory T cell; CAPE, caffeic acid phenethyl ester. Russell, S. J.. 2002. RNA viruses as virotherapy agents. Cancer Gene Ther. 9: 961-966. Hirasawa, K., S. G. Nishikawa, K. L. Norman, T. Alain, A. Kossakowska, P. W. Lee. 2002. Oncolytic reovirus against ovarian and colon cancer. Cancer Res. 62: 1696-1701. Alain, T., K. Hirasawa, K. J. Pon, S. G. Nishikawa, S. J. Urbanski, Y. Auer, J. Luider, A. Martin, R. N. Johnston, A. Janowska-Wieczorek, et al 2002. Reovirus therapy of lymphoid malignancies. Blood 100: 4146-4153. Strong, J. E., M. C. Coffey, D. Tang, P. Sabinin, P. W. Lee. 1998. The molecular basis of viral oncolysis: usurpation of the Ras signaling pathway by reovirus. EMBO J. 17: 3351-3362. Marcato, P., M. Shmulevitz, D. Pan, D. Stoltz, P. W. Lee. 2007. Ras transformation mediates reovirus oncolysis by enhancing virus uncoating, particle infectivity, and apoptosis-dependent release. Mol. Ther. 15: 1522-1530. Smakman, N., D. J. van den Wollenberg, I. H. Borel Rinkes, R. C. Hoeben, O. Kranenburg. 2005. Sensitization to apoptosis underlies KrasD12-dependent oncolysis of murine C26 colorectal carcinoma cells by reovirus T3D. J. Virol. 79: 14981-14985. Kalinski, P., A. Giermasz, Y. Nakamura, P. Basse, W. J. Storkus, J. M. Kirkwood, R. B. Mailliard. 2005. Helper role of NK cells during the induction of anticancer responses by dendritic cells. Mol. Immunol. 42: 535-539. Kamath, A. T., C. E. Sheasby, D. F. Tough. 2005. Dendritic cells and NK cells stimulate bystander T cell activation in response to TLR agonists through secretion of IFN-αβ and IFN-γ. J. Immunol. 174: 767-776. Osada, T., T. M. Clay, C. Y. Woo, M. A. Morse, H. K. Lyerly. 2006. Dendritic cell-based immunotherapy. Int. Rev. Immunol. 25: 377-413. Iwamoto, M., H. Shinohara, A. Miyamoto, M. Okuzawa, H. Mabuchi, T. Nohara, G. Gon, M. Toyoda, N. Tanigawa. 2003. Prognostic value of tumor-infiltrating dendritic cells expressing CD83 in human breast carcinomas. Int. J. Cancer 104: 92-97. Errington, F., J. Jones, A. Merrick, A. Bateman, K. Harrington, M. Gough, D. O’Donnell, P. Selby, R. Vile, A. Melcher. 2006. 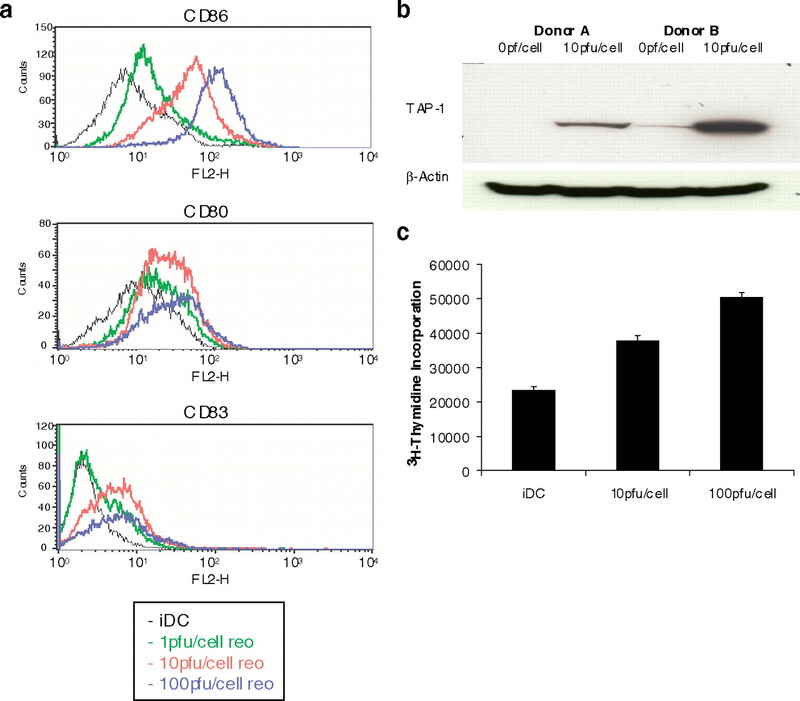 Fusogenic membrane glycoprotein-mediated tumour cell fusion activates human dendritic cells for enhanced IL-12 production and T-cell priming. Gene Ther. 13: 138-149. Merrick, A., F. Errington, K. Milward, D. O’Donnell, K. Harrington, A. Bateman, H. Pandha, R. Vile, E. Morrison, P. Selby, A. Melcher. 2005. 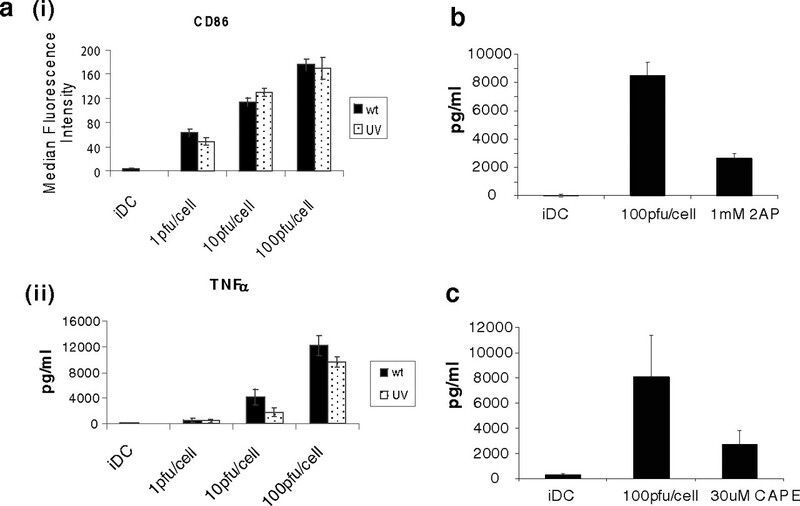 Immunosuppressive effects of radiation on human dendritic cells: reduced IL-12 production on activation and impairment of naive T-cell priming. Br. J. Cancer 92: 1450-1458. Whiteside, T. L., J. Stanson, M. R. Shurin, S. Ferrone. 2004. Antigen-processing machinery in human dendritic cells: up-regulation by maturation and down-regulation by tumor cells. J. Immunol. 173: 1526-1534. Warger, T., P. Osterloh, G. Rechtsteiner, M. Fassbender, V. Heib, B. Schmid, E. Schmitt, H. Schild, M. P. Radsak. 2006. Synergistic activation of dendritic cells by combined Toll-like receptor ligation induces superior CTL responses in vivo. Blood 108: 544-550. Salio, M., M. Cella, M. Suter, A. Lanzavecchia. 1999. Inhibition of dendritic cell maturation by herpes simplex virus. Eur. J. Immunol. 29: 3245-3253. Majumder, B., M. L. Janket, E. A. Schafer, K. Schaubert, X. L. Huang, J. Kan-Mitchell, C. R. Rinaldo, Jr, V. Ayyavoo. 2005. Human immunodeficiency virus type 1 Vpr impairs dendritic cell maturation and T-cell activation: implications for viral immune escape. J. Virol. 79: 7990-8003. Connolly, J. L., S. E. Rodgers, P. Clarke, D. W. Ballard, L. D. Kerr, K. L. Tyler, T. S. Dermody. 2000. Reovirus-induced apoptosis requires activation of transcription factor NF-κB. J. Virol. 74: 2981-2989. Tyler, K. L., P. Clarke, R. L. DeBiasi, D. Kominsky, G. J. Poggioli. 2001. Reoviruses and the host cell. Trends Microbiol. 9: 560-564. Bonnet, M. C., C. Daurat, C. Ottone, E. F. Meurs. 2006. The N-terminus of PKR is responsible for the activation of the NF-κB signaling pathway by interacting with the IKK complex. Cell. Signal. 18: 1865-1875. Natarajan, K., S. Singh, T. R. Burke, Jr, D. Grunberger, B. B. Aggarwal. 1996. Caffeic acid phenethyl ester is a potent and specific inhibitor of activation of nuclear transcription factor NF-κB. Proc. Natl. Acad. Sci. USA 93: 9090-9095. Ferlazzo, G., M. Pack, D. Thomas, C. Paludan, D. Schmid, T. Strowig, G. Bougras, W. A. Muller, L. Moretta, C. Munz. 2004. Distinct roles of IL-12 and IL-15 in human natural killer cell activation by dendritic cells from secondary lymphoid organs. Proc. Natl. Acad. Sci. USA 101: 16606-16611. Warren, H. S., M. J. Smyth. 1999. NK cells and apoptosis. Immunol. Cell Biol. 77: 64-75. Kayagaki, N., N. Yamaguchi, M. Nakayama, H. Eto, K. Okumura, H. Yagita. 1999. Type I interferons (IFNs) regulate tumor necrosis factor-related apoptosis-inducing ligand (TRAIL) expression on human T cells: a novel mechanism for the antitumor effects of type I IFNs. J. Exp. Med. 189: 1451-1460. Tamang, D. L., D. Redelman, B. N. Alves, L. Vollger, C. Bethley, D. Hudig. 2006. Induction of granzyme B and T cell cytotoxic capacity by IL-2 or IL-15 without antigens: multiclonal responses that are extremely lytic if triggered and short-lived after cytokine withdrawal. Cytokine 36: 148-159. Matsumoto, M., K. Funami, M. Tanabe, H. Oshiumi, M. Shingai, Y. Seto, A. Yamamoto, T. Seya. 2003. Subcellular localization of Toll-like receptor 3 in human dendritic cells. J. Immunol. 171: 3154-3162. Washburn, B., V. Schirrmacher. 2002. Human tumor cell infection by Newcastle Disease Virus leads to upregulation of HLA and cell adhesion molecules and to induction of interferons, chemokines and finally apoptosis. Int. J. Oncol. 21: 85-93. Grote, D., R. Cattaneo, A. K. Fielding. 2003. Neutrophils contribute to the measles virus-induced antitumor effect: enhancement by granulocyte macrophage colony-stimulating factor expression. Cancer Res. 63: 6463-6468. Zitvogel, L.. 2002. Dendritic and natural killer cells cooperate in the control/switch of innate immunity. J. Exp. Med. 195: F9-F14. Menon, A. G., C. M. Janssen-van Rhijn, H. Morreau, H. Putter, R. A. Tollenaar, C. J. van de Velde, G. J. Fleuren, P. J. Kuppen. 2004. Immune system and prognosis in colorectal cancer: a detailed immunohistochemical analysis. Lab. Invest. 84: 493-501. Hsia, J. Y., J. T. Chen, C. Y. Chen, C. P. Hsu, J. Miaw, Y. S. Huang, C. Y. Yang. 2005. Prognostic significance of intratumoral natural killer cells in primary resected esophageal squamous cell carcinoma. Chang Gung Med. J. 28: 335-340. Zeng, J., P. Fournier, V. Schirrmacher. 2002. Induction of interferon-α and tumor necrosis factor-related apoptosis-inducing ligand in human blood mononuclear cells by hemagglutinin-neuraminidase but not F protein of Newcastle disease virus. Virology 297: 19-30. Alves, N. L., B. Hooibrink, F. A. Arosa, R. A. van Lier. 2003. IL-15 induces antigen-independent expansion and differentiation of human naive CD8+ T cells in vitro. Blood 102: 2541-2546. Thorne, S. H., R. S. Negrin, C. H. Contag. 2006. Synergistic antitumor effects of immune cell-viral biotherapy. Science 311: 1780-1784. Hirasawa, K., S. G. Nishikawa, K. L. Norman, M. C. Coffey, B. G. Thompson, C. S. Yoon, D. M. Waisman, P. W. Lee. 2003. Systemic reovirus therapy of metastatic cancer in immune-competent mice. Cancer Res. 63: 348-353. Steele, T. A., D. C. Cox. 1995. Reovirus type 3 chemoimmunotherapy of murine lymphoma is abrogated by cyclosporine. Cancer Biother. 10: 307-315.